I came to a startling realization this summer: I have forgotten how to relax. At some point in the last three years, I have gone from someone who could sit for hours enjoying a good book and a cup of coffee, to a girl who gets anxious if I sit down for more than half an hour. I’m conflicted about this personality trait. On the one hand, worriers get stuff done. Very rarely do I panic about something that’s due tomorrow, because I’ve been working like a crazy person to get it done, and done well, for the past week. But on the other hand, I tend to work myself to the bone for something, and after I’ve accomplished it, thought to myself: “now, why did I freak out about that? That wasn’t bad at all.” Nothing like awesome hindsight skills. This semester has begun in an interesting way, and I’m already feeling a little out of sorts. My past two years at school, I feel like I’ve known where I’m going and what the next goal is. Now that I’m beginning to steer a little more towards the English minor side of my degree, I’m beginning to feel a little bit out-to-sea. How important is getting cast/called back? How important is it to be writing at least an hour a day? How important is it to remain calm, cool and collected during the craziness? And, possibly the most problematic of all, how do I keep myself from sinking under the weight of all these questions? So I am making a commitment to becoming a better relaxer (I think that sentence says a lot about my personality: I can’t just relax. I have to COMMIT to it. Oi vey, y’all). 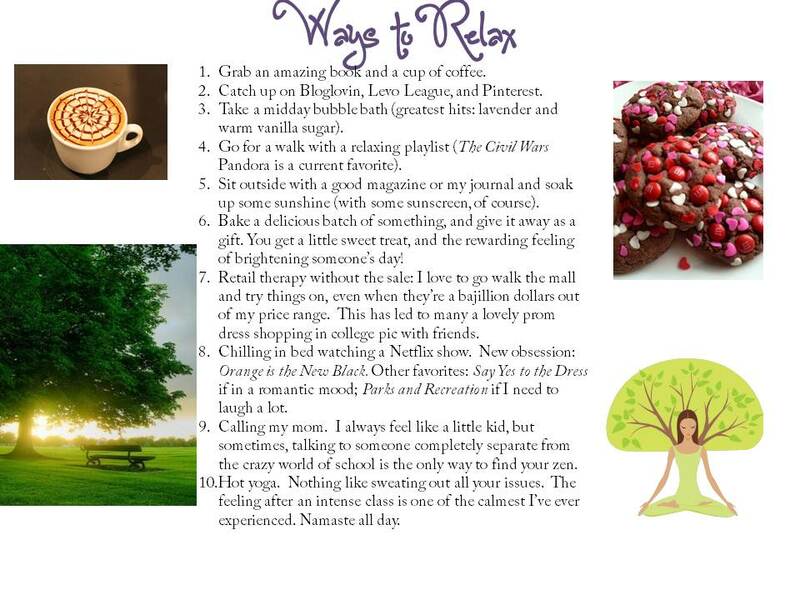 I’ve been brainstorming some ways to get my mind and body into that comfort zone…but I would love some suggestions! This is going to be a bit of an uphill battle for my little worry-wart self…good thing I love a challenge.